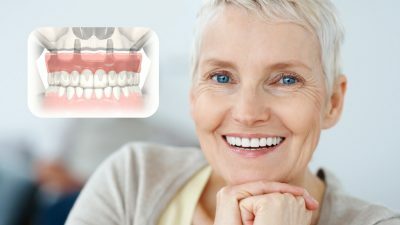 All-On-4 dental implants refers to a surgical technique to replace missing teeth, in which four titanium dental implants are used to support a full fixed bridge of 10-14 teeth. The All-On-4 dental implant procedure is typically utilized for edentulous patients (those with no natural teeth remaining) or those patients whose teeth are severely broken down, decayed, or compromised by gum disease. In the past, these patients’ only option for teeth replacement was to deal with the inconvenience and discomfort of wearing dentures. With the All-On-4 dental implants prosthodontic procedure, patients may now have their entire upper and/or lower sets of teeth replaced with permanent prosthetic bridges that look and feel just like their natural teeth. Because of the groundbreaking technology of using angulated dental implants, the All-On-4 technique does not require bone grafting and can be used for patients whose jawbone loss prevents them from being candidates for traditional vertical dental implants. With approximately 40 million Americans having lost all of their natural teeth, the All-On-4 dental treatment offers an option that can improve quality of life and restore a confident smile in less time than ever before. Dental implants have become the new standard for replacing missing teeth, and for those who need entire arches replaced, the All-On-4 procedure can be a life-transforming solution. 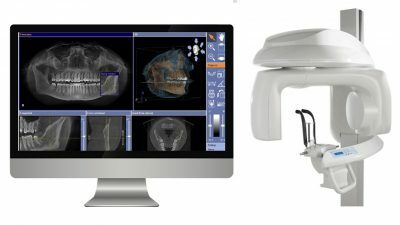 The All-On-4 dental implants process begins with a thorough evaluation of the jawbone structure through the use of a Cone Beam CT scan (CBCT), which provides a 3-dimensional image of the teeth, jawbone, and surrounding structure. This CT scan generated 3-D model can then be used in virtual reality software to plan the implant placement without the presence of the patient. The results are more accurate implant placement, and less chair time for the patient at the surgery office. Once your surgeon has analyzed your CBCT scan and has determined that All-On-4 dental implants are the best solution for you, your dental implant surgery will be scheduled. The All-On-4 treatment is a minimally invasive in-office procedure during which local anesthesia or IV sedation will be utilized to make sure you are comfortable. It is not necessary to have a dental implant placed for every missing tooth. Rather, with the All-On-4 method, four strategically placed implants are placed within the jawbone where the root portion of each tooth would normally be. These implants will ultimately secure the prosthetic bridge in place to restore the entire arch of teeth. The four implants are precisely placed, with 2 located in the front and 2 in the back of each affected jaw. The implants in the back are placed at an angle to avoid any bone deficiencies or anatomical limitations. Each arch typically takes about 2 ½ hours to place. During the All-On-4 dental implants surgery, your oral surgeon will place a temporary prosthesis on the implants, which will allow you to be able to eat and smile with confidence. This temporary bridge looks and feels just as your eventual permanent bridge will feel once your jawbone has healed. After your implant surgery, you will spend a short time in the recovery room until you are ready to go home. 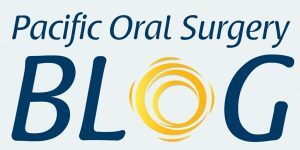 It is recommended that you have a friend or family member drive you home after your All-On-4 dental procedure. You will need to eat a soft food diet for several weeks as your implants integrate with your jawbone. Your oral surgeon will advise you on when to transition to a regular diet. The healing process will take approximately 6-8 months. During this time, your dental implants are fusing with the living cells of your jawbone to form a strong anchor for the new teeth you will soon receive. 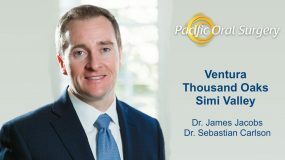 When the healing is complete, you will have a follow-up appointment to get your new permanent bridge, usually consisting of at least 12 teeth. 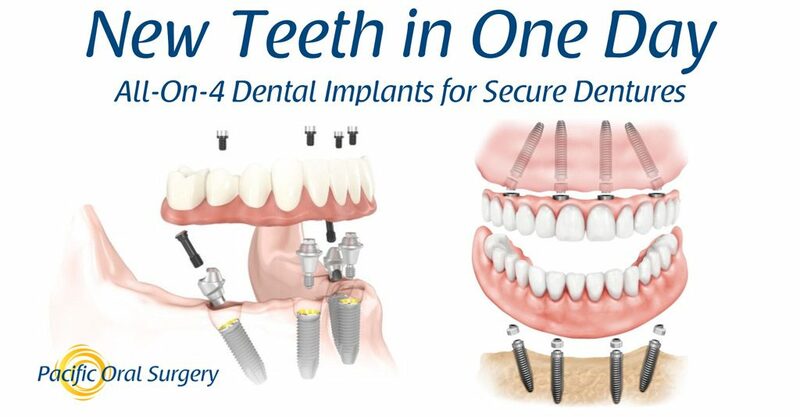 All-On-4 dental implants allow patients to enjoy the look, feel, and function of natural teeth. With All-On-4 dental implants, patients have the freedom to eat and smile without worrying. Many patients report feeling and looking more youthful. Oral health is also improved with All-On-4 implants due to halting jawbone loss. 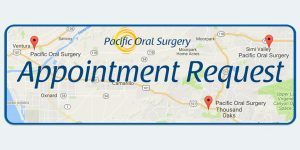 At Pacific Oral Surgery, we are committed to helping our patients achieve beautiful, healthy smiles that last a lifetime. If you currently wear dentures or if you have been told that you are at risk for multiple tooth loss due to decay or periodontal disease, contact our office to find out if All-On-4 dental implants are the solution for you.